Click here to view the PBS documentary Stretched to the Limit, a piece on the Grosso family of Queen Creek, AZ, who are struggling with the high cost of car-centered development. Visit www.gorideshare.org to find someone else who's going your direction. Combining trips and carpooling saves! 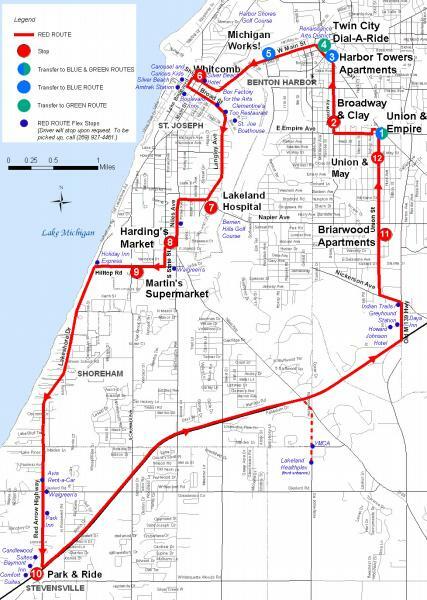 Click here to view public transit information for Southwest Michigan. Click here to view route schedules and maps for the Twin Cities Area Transit Authority's scheduled bus routes. The Twin Cities Area Transportation Study is working on a long range plan for bicycle and pedestrian infrastructure. Choose to live in an Accessible location! If it's an option for you, living near where you work and shop is one of the most direct ways to cut down on your transportation costs. In addition to taking account of infrastructure that encourages non-motorized transportation (i.e. walking and bicycling), check out a location's walkscore to see what types of amenities you can access without straying far from your front door. Airhead - How much air pollution do you create? TravelMatters - What are your carbon emissions from transportation? Click here to view the Housing + Transportation Affordability Index, to see how much money residents of your neighborhood spend out of their household budget for housing and transportation. 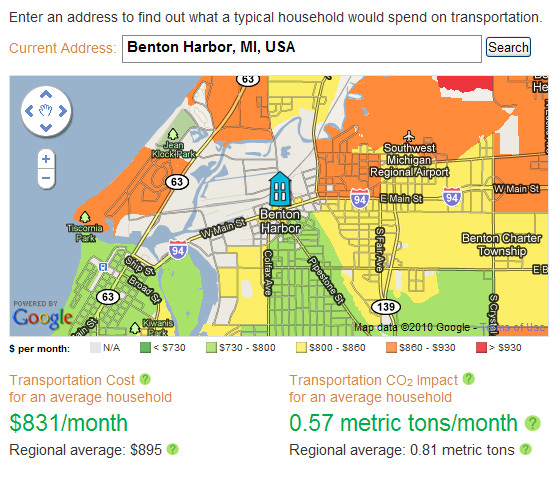 Click here to view the average cost of transportation for a household in your neighborhood. INVEST is a free web-based sustainability self-assessment tool that helps transportation agencies assess and improve the level of sustainability of their transportation projects, plans, and programs. It translates the broad sustainability principles of improving economic, social, and environmental outcomes into specific actions that transportation agencies can implement. An INVEST user toolkit is newly available as a resource to transportation agencies. The toolkit can be downloaded from www.sustainablehighways.org under the “Learn” tab. Slide presentation – offers an overview of INVEST. You can customize it in order to make a presentation to your own organization or stakeholders. We did have a short training at the MTPA conference in Holland, but FHWA is also pleased to offer a full day, in-person training on INVEST as well as shorter, 1.5 hour webinar version. Please let me know if you are interested in training opportunities, we’d be happy to organize this for you. FHWA has an ongoing research project to develop case studies based on the use of INVEST. FHWA continues to seek additional participants, particularly state DOTs using the operations and maintenance module, as we do not currently have any projects of that type. The solicitation for the project and associated funding is available under the announcement selection of www.sustainablehighways.org. A 50% non-Federal match is required. This page last updated on 12/12/2013.